A recently completed sportsequip.co.uk Fitness Trail, installed in the eco-park play area in Great Cambourne made front page news last month when it received it’s official opening by the parish council. 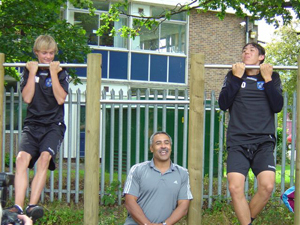 The £10,000 project has created nine fitness stations around the park and offers an outdoor exercise circuit suitable for use by teenagers and adults. Advertised as a 10 K Adventure race – The UK’s new cult event for triathletes, cross country runners and those who just like to get cold, muddy and wet the first Chepstow Stampede is to be run at Chepstow Racecourse in October 2010. Fitness Trail manufacturers and installers sportsequip.co.uk were employed to help convert the existing equestrian 3 day event course so it was suitable for a human event. 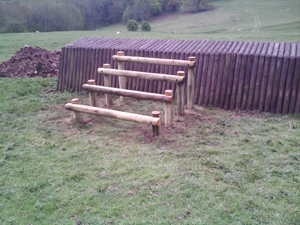 This involved the manufacture of both adapted and brand new fitness stations that suited both the terrain and utilised the existing features and horse jumps. Event organisers say ‘WARNING – You WILL get Wet and Muddy’ and describe it as being ‘Set within the stunning grounds and challenging terrain of Chepstow Racecourse and Piercefield Park, Monmouthshire, the course promises to be different from any run organised before. If running 10k across natural rugged terrain is not challenging enough for you, unique and varied obstacles will be in place to push the limits of all abilities and fitness levels. Take on obstacles like Zig Zag Woods, Cargo Net Valley and Severn View Jump before competing in the Mile Time Trial and the Water Run. Try your hand at sledging down Toboggan Hill, clambering over The Gauntlet and up the ropes at Heartbreak Hill, not to mention getting a dunking at Sheep Dip Valley. 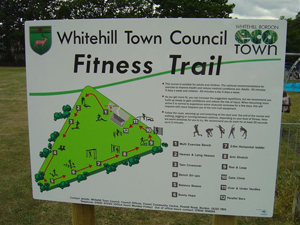 Leading adults fitness trail manufacturers sportsequip.co.uk recently finished Whitehill Bordon’s Eco Fitness Trail, which is the first project to be completed using Eco-town funding. The outdoor course, which stretches over half a mile in the recreation ground in Mill Chase Road, Whitehill, Hampshire, was officially opened by double Olympic gold medallist Daley Thompson and the town’s mayor Cllr Adam Carew on 29th July 2010. The timber used to make the wooden trail is environmentally friendly because it comes from a renewable source and is British grown. It also included safety surfacing Compliant Grass Tiles to make the course as safe as possible. The calorie-busting workout includes equipment which will give users a cardiovascular boost as well as strengthening exercises.